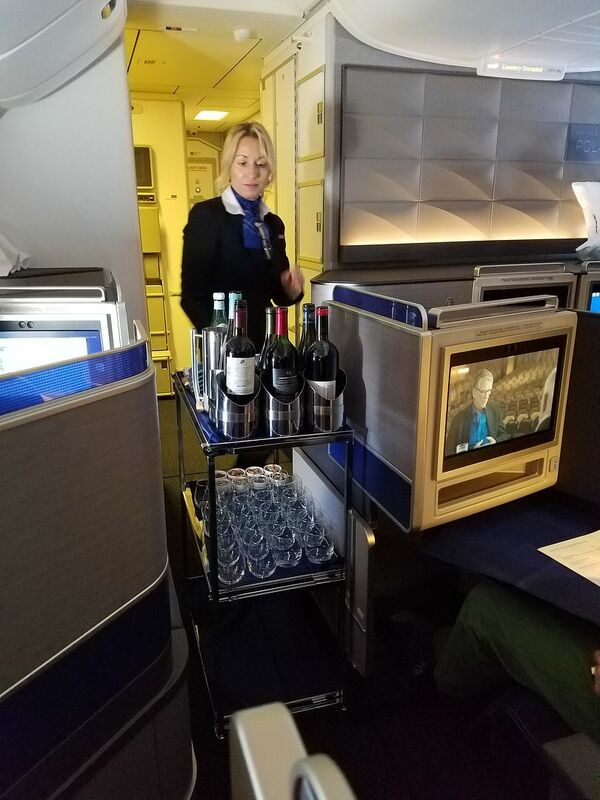 I asked United about plans for their bloody mary and minosa carts and their wine cart in Polaris international business class, and they confirmed that these will be eliminated May 1. They tell me that this will speed up beverage service and that’s what business class customers want. There won’t be a dedicated bloody mary cart, but there will still be bloody marys. While they insist this is more about modifying service flow so that passengers can get more rest, it sems to me that not putting all the wines and drink options in front of customers should also reduce consumption. United revealed in the spring that they were 300% over budget on wine. Presenting wine flights from a cart encourages customers to drink more, taking the carts away should reduce consumption. What a dumb novelty. Everyone knows you can order a Bloody Mary, why the need to parade it around on a cart? Tell me how the lazy, uninterested, could care less United Flight Attendants will feel about hand delivering multiple orders of flights of wine, custom bloody Mary’s and mimosas? All that back and forth walking through those large business class sections? Answer: they will hate it! Which in turn, will also reduce consumption and refill requency….again to UA’s advantage. By the time even half of their planes are outfitted with proper Polaris seats not only will they be obsolete, but all the service perks and special items introduced in 2016 will be gone as well. Pathetic. This is a typical & pathetic UA thing to do. Polaris has quickly reverted to the median. I’ve been flying American this year instead of United. The food is so forgettable/regrettable everyone seems to skip it along with beverages and goes to bed right after takeoff. Problem solved. Will they still offer the wine flights on request? We really liked the concept because it eliminates eye rolling by the FA when you want to try a wine before a full pour. 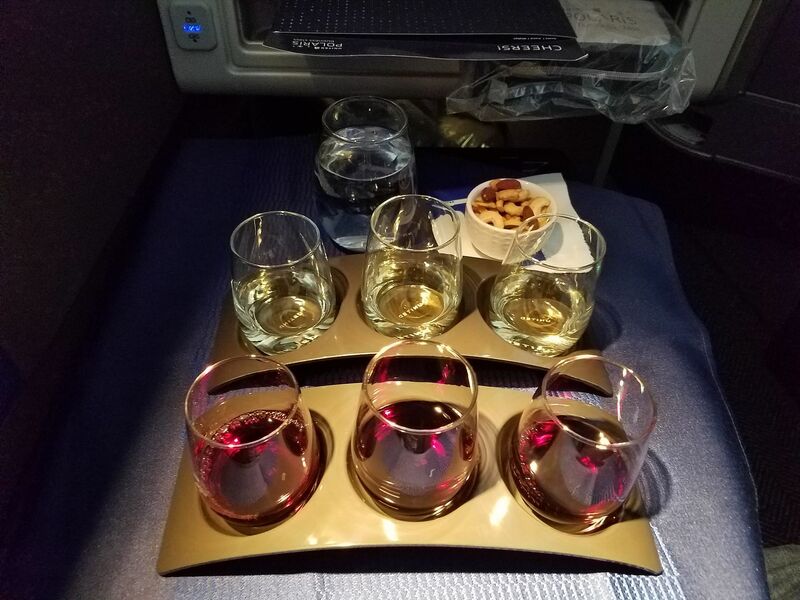 The wine flights in flight was the most stupid idea. Although I recognize that United was trying to make Polaris more special, few in Business Class want Bloody Mary carts or flights of wine. Just get me the damn drink. No wonder when we have a choice, we fly Lufthansa! This cutesy service concept was needless from the beginning. You don’t have to be an economist, let alone a F&B Vice President, to know how costs increase when you push a cart around. However, what is at issue is the still tainted concept of congenial service delivery! On Lufthansa, I do not have to worry about FAs ignoring eye sight, as they are spot on in their timing for refills. For some reason, UA has failed to break the mentality of FAs to understand the difference of service ORD-LGA vs. ORD-FRA. Given the abnormal delays in rolling out the Polaris seats, I agree with the other comment here that when it is finally achieved, it will be totally irrelevant! Take another bow Marketing-launching Polaris minus its main feature. This is like Amtrak selling business class on its “Northeast Corridor” (WAS-BOS) by offering just another coach. Amazing how quiet Oscar Munoz is during all of these Polaris cutbacks. Introduce new service and then take it all back? Way to go United. I love wine and I love flights (both kinds). Glad they’re not getting rid of those, as I’ve yet to experience Polaris! Anyways, a FA friend said part of why they were wasting so much wine is they’d open all 18 bottles at the start of each flight. Now they only open them once requested so presumably a few go untouched.